This year there will be another change in the law for car seats. Manufacturers who produce backless booster seats will no longer make them for young children, only for those over 125cm tall and weighing more than 22kg. The change is expected to come into force from March and will only affect new products. Diono lead the way with safety and innovation producing only high back boosters which offer side impact protection. 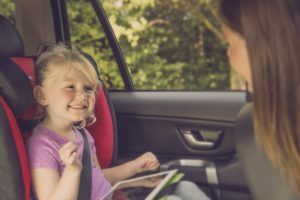 Although the European Safety Regulations don’t require this, Diono believe side impact protection significantly improves the safety of children when travelling in the car and as such ensure all their boosters have deep dual wall side impact protection. The range of Diono highback boosters have been engineered with added strength and important safety elements to give parents peace of mind. The multi award-winning Diono Monterey 2 £120, is the ultimate Group 2/3 High Back Booster for your child. Overprotective in all the right ways, it is the only booster seat to have extra deep metal reinforced wings, 360 energy absorbing foam and a strengthened seat base significantly increasing defense against impact. It also features isofix connectors, a 12 positon head rest and expandable sides to get the best fit. The seat bottom has extra length for leg support and features thick AirTek™ foam for total comfort. Children adore their own retractable cup holders too, which are extra deep and angled to keep drinks upright. The new Diono MXT £85. A comprehensive booster seat with modern styling. The MXT features metal reinforced expandable sides and energy absorbing foam for superior protection. There is a 12 position head rest and longer seat bottom to properly fit children as they grow. MXT is easy to connect into the car utlising an integrated Y strap so the booster doesn’t move when not in use. Retractable cup holders and snack trays keep bits and bobs tidy! The brand new Diono Hip, £40 has just launched and proves parents don’t need to spend a fortune to get good side impact protection. This durable, high quality group 2/3 High Back Booster seat, is lightweight and fits children up to 160cm tall with an extra wide seat. The head rest is extra deep and dual wall construction provides added strength. The extendable head rest has 6 positions and fixed cup holders give storage for drinks, snacks and toys. The change in legislation moves the lower weight of backless boosters from 15kg to 22kg. This is because previously parents were transitioning too early from a group 1 seat with a harness, straight to a backless booster. The previous 15kg lower limit was meant to accommodate extremely tall and very skinny older children but parents were unaware of this and thought the 15kg limit was the point they had to change to a booster seat. In some cases this meant children as young as 2.5 years were riding on a backless booster! Diono has three top car seat recommendations for parents. Firstly to stay rear facing as long as possible because it protects the neck, especially below 2 years but ideally until children are 4. 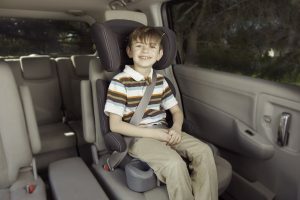 Once forward facing staying in a 5 point harness as long as possible will keep children in the safest position and hold then into the seat more effectively than a seatbelt. Then lastly when transitioning to a booster, a high back one that has deep strong sides will offer the most amount of protection until children reach 12 or 135cm and no longer need a car seat.